How do I use a tent to sleep for free? Wild camping (also called 'free camping' or 'stealth camping') is sleeping in a tent outside of organised campsites (where you have to pay). For walkers, climbers, kayakers and cyclists, wild camping is often inevitable, liberating and highly enjoyable. I have a lightweight 2 man tent which I find perfect for walking and cycling. If you are camping beside your car then the size and weight of the tent is not really important, its also possible to take duvets, gas barbecues, cricket sets, cases of beer, cool boxes full of meat, blankets, Frisbees, kites, tables and chairs. For me, though, there is a contrary pleasure in having a tolerable nights sleep somewhere remote and making do with just the bare necessities. 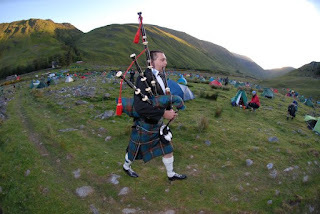 In Scotland it is a legal right to be able to put your tent up for the night. This is part of the joyous Land Reform Act which gives access rights to climbers, walkers, kayakers etc. In England and Wales there is no right to camp wild. That said, camping wild in mountainous and rural areas is generally accepted if you are discreet. You can always ask the land owner for permission. I once asked a farmer if I could camp on his land and he said it would be fine. In the morning his wife cooked us a big fried breakfast and then got us to help feed the cows. So far, no one has ever told me to move on or, when asked, refused to let me pitch my tent on their land for a night. In the French Alps its considered acceptable to camp anywhere in the mountains above the tree line. Its good style to pitch late and strike early. 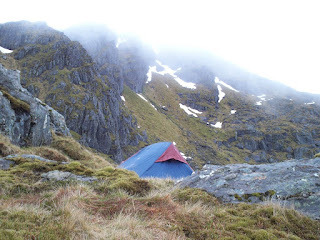 The Mountaineering Council of Scotland have an advice leaflet about wild camping. The reasons the right to camp wild would be taken away are likely to be because of people building fires, getting drunk, playing music loud, leaving litter, driving on soft ground and pooing in rivers. How should you choose a wild camp spot? As long as it is reasonably level and you can get pegs in the ground it will do as a camp spot. The optional luxuries are being sheltered from the wind, having water nearby and having a cracking view. Personally, the best wild camps for me are in the mountains high up beside a lochan, on a broad bealach or by a river in huge glaciated glen. I like to be out of sight of the road and from houses. Also, I like to avoid places likely to be overused especially on weekends. These are places such as popular roadside camping spots, car parks, next to pubs, or on popular footpaths. These spots tend to become like official campsites without the benefit of having someone around to prevent problems with litter, human waste, erosion and noise. They attract midges too. Much better to camp above 600m where there are no midges or Buckfast drinkers, just great scenery and the soothing lullaby of waterfalls. We had our spanish friends Dafne and Josep round for dinner, beers, and a game of cards. Dafne taught us a game called Quadrado. It is a game for 4 people and you play in pairs with each pair sitting opposite one another. Before the game begins, each pair must think of a secret signal (for example scratching your nose or touching your elbow). Four cards are dealt out to each player and four cards are placed face up on the table. All players may then throw a card down on to the table and pick up another. Players do not need to take turns, its basically just a free for all. The aim is to get all four cards the same (i.e. four kings, or four eights, etc. ). If noone is exchanging the cards on the table anymore then they are placed in a discard pile. Another four cards are then drawn from the pack. Play then continues in the same way. When a player has four cards the same he must give the secret signal to his partner. His partner can then slap his hand on the table, shout "Quadrado! ", and score one point. If your partner is giving the secret signal and you also have four cards the same you can slap your hand on the table, shout "Doble quadrado!" and score two points. If you think you have guessed the opposing pair's secret signal you can slap your hand down and shout "Corto Quadrado!" If you guess right you score a bonus point and the other pair must go into another room and think up a new signal. If you are wrong, then play continues. We were dropped off by the coach at the Cluanie Inn and I thought I would soon be running up the steep slope I had descended with Alastair a couple of weeks ago. No sooner had we got out of the coach than a marshal herded us into a minibus and we were off again to the real start. Alex and I competed in the Lowe Alpine Mountain Marathon this weekend. Mystery shrouded the location until last Thursday night. 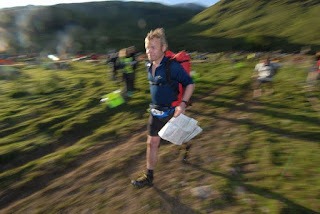 Even then, we only knew that we were going to Kintail, the checkpoints for the route are only disclosed at the start line. After the check point we took on an early steep ascent and even quicker descent. Alex slipped and slid a hundred metres or so down a grassy gully. Thankfully he was mostly unscathed and we continued on our way. With weighty packs, with compulsory tent and stove, we navigated to the checkpoints, mainly lochans, knolls, stream junctions and, the hardest to find, a spur. Despite a great deal of climbing, often very steep, the course avoided summits. As we ran down the path to the mid camp we spotted the 500 or so tents pitched in the glen like a mini Glastonbury. We washed our legs in the river, found the other CAACers, ate as much cous cous as we could handle and slept. I could easily have slept until the afternoon but the bagpipe player had other ideas and woke us all up at 5am. We packed up the tent breakfasted on flapjacks and picked up the route for day two. Setting off at a reluctant jog we passed the slit trench and the stench of poo spurred us on away up the glen. The weather was glorious and with fantastic views we leapfrogged a South African and San Franciscan pair. We'd overtake them at a run on level ground and they would creep up on us on the hills. With our packs digging into our shoulders and blistered feet we arrived back at Morvich for chili, tea, cake and sunshine! Meanwhile, Magda went with some friends and climbed Ben Cruachan. I'm a tad envious as Russ and I had to miss this one out due to encroaching darkness (see here). But it will make a good day out on my own at some point! In a new series of articles on this blog called SLEEP CHEAP I am going to try all the different ways to sleep for free or cheaply I can think of. In Scotland, sleeping in a bothy is a great choice. Bothies are unlocked shelters generally in remote and mountainous areas in Scotland. There are about a hundred or so, typically plain stone built shelters with a slate or corrugated iron roof. They usually have a fire place or perhaps a wood burning stove. Some have raised sleeping platforms but usually its a case of sleeping on a wooden or stone floor. Sometimes there is furniture left behind and even pots and pans, but many are simple and sparse. They don't have electricity, water or toilets. They get you out of the wind and rain, like Bob Dylan sang: "Come in she said I'll give you shelter from the storm". 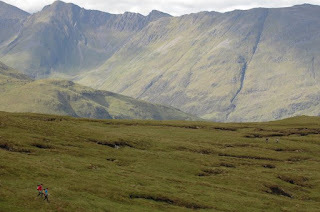 Due to being in remote locations, bothies are mainly used by climbers, walkers, cyclists, and in some occasions boaters. If you hang out with this kind of outdoor people you are bound to find out about the location of a few bothies. Bothies are maintained by work groups organised by a charity called the Mountain Bothies Association. If you join for £20 you get a handbook listing the locations. If you are too tight to pay that then looking on the MBA's gallery page or doing a Google image search might help locate one on your intended trip. Guide books, walking magazines and websites quite often share the location of one or two bothies (for example as possible accommodation on a route). The MBA like to minimise publicity to reduce the problems caused by overuse, like rubbish, vandalism, fire, and human waste. The MBA have a code of use the bothies. The gist of it is to leave it in the state you found it in. It is worth having a small hand trowel for digging a hole (for doing your business), although there is often a spade provided, and maybe candles to leave as a replacement for any you use when you are there. Leaving some fire wood (including kindling), or having a bash and cutting peat, means the next people can get a fire going without having to go foraging for fuel. It is old hat, and a bad idea, to bury rubbish, better to burn the paper bits and carry the rest out. Its also more sociable to cook on a stove rather than on the fire (hogging the heat) but sausages on a stick might be an option. For me one of the coolest things about bothies is meeting eccentric characters. I think its damn good to be offered a nip of scotch from a stranger and I would recommend sharing whatever goodies you may have (chocolate biscuits, stories, etc) with other people in the bothy. When you leave sweep the floor, don't leave food behind that rats like (or that rots), make sure the fire is out and shut the door. What if the bothy has burned down? 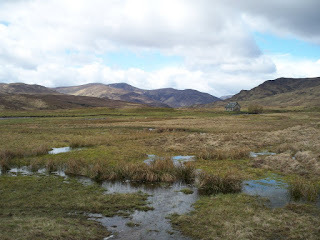 Its worth having a back-up plan in case the bothy is not there, ruined or overcrowded. A tent or a bivvy bag would do the job. I'll write more about these and other types of free accommodation in future. On the hottest day I have ever known in Scotland, I opted out of looking at Inverary Castle with the others and instead ran up Beinn Bhuidhe. I started out along the track in Glen Fyne and took the left fork through Merk Park and up to a col where Merk Burn begins. From there I climbed up north and then reached a flat bit where I managed to run as far as the base of the ridge. Here I walked up a steep gully. I then jogged along the ridge to the summit. The trig point, usually a surefire navigational landmark, was toppled over and incorporated into the cairn. I ran back the same way. I had my shirt off for the whole run. In Scotland. I met the others at a beach near Bellanoch and we had a bbq, drank beer and enjoyed the sunshine. Sunday was a lying on the beach day and I finished reading The Hungry Cyclist by Tom Kevill-Davies (see thehungrycyclist.com). I have to say, I loved this book. He rode his bike the scenic route from NYC to Rio, searching for the perfect meal. His route took in the Great lakes, crossing the Rockies, Mexican deserts, a dodgy river journey across a continent and hundreds of miles of Brazilian beach. On the way he tastes bull's testicles, pigs brain, hallucinogenic mushrooms, armadillo, fried piranha cooked outside a brothel and he learns how to barbecue a guinea pig. More often his search for the perfect meal is successful. Throughout the book there are the best recipes from each area he has cycled through. I'm hoping to try making some of his recipes, maybe Ron Don, Pupusas, Fish Tacos or Hangtown Fry, as soon as I can figure out where to get the ingredients. Along the way he met some coluorful characters, such as a Panamanian fireman who thought he was MacGyver and a lycra clad German cyclist whose idea of a good meal was birdseed, jam and bananas. I think there are two great strengths to this book. Firstly, there is the strong theme of food. With a distinct purpose to his trip, the writing is focused on the next newly discovered dish, and the people who cook and eat it. Many travelogues become a little self indulgent to the point that the author talks only about himself and his problems, and almost ignores his surroundings. This was impossible for Tom because of the second great strength: his superb sense of humour. Often self deprecating and naturally charming, on one occasion I dropped the book laughing.